Some women’s rights supporters hoped 2016 would be the year the United Nations elected its first woman secretary-general. It did not happen, as the U.N. voted in October to make Antonio Guterres secretary-general. Guterres is a former prime minister of Portugal. Like the eight others who held the U.N.’s top position, he is a man. Jean Krasno chaired the Campaign to Elect a Woman U.N. Secretary General. Krasno said she was “very disappointed” at the election of Guterres. But she was happy when he agreed to meet with her just days after his election. Krasno came away from their meeting hopeful about how he might change the U.N.
She said Guterres told her he hopes to fill half the top U.N. leadership positions he controls with women. That would be a big change. Anne Marie Goetz, professor at New York University’s Center for Global Affairs, said the U.N. has yet to give more than 25 percent of its top positions to women. Goetz said those who want more responsibility for women in international relations had two reasons for disappointment in 2016. One was the defeat of the seven women candidates for secretary-general. The other was the defeat of Hillary Clinton in the American election. Clinton was hoping to become the first woman president of the United States. But she lost to Donald Trump in the U.S. presidential election. In a column written for the website opendemocracy.net, Goetz said she and others were looking forward to Clinton pushing the U.N. to do more on issues important to women. Among them, Goetz said, are rights of women to own property, fair pay, reproductive freedom and more efforts to stop gender-based violence. 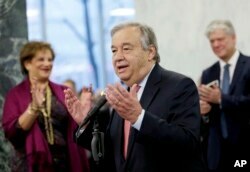 Tuesday was Guterres’ first day on the job as secretary-general. He talked about reforming what some say is an unresponsive U.N. bureaucracy. Earlier, Guterres promised new efforts to bring peace to some of the world’s major conflicts. “There are no miracles…and the only way for us to achieve our goals is to work as a team,” he said. Antonio Guterres on his first day as U.N. secretary-general. Jean Krasno, who led the Campaign to Elect a Woman U.N. Secretary-General, said the system for choosing a new U.N. chief worked against women. Seven women competed for the position. Yet she said her group found many more women who had the experience necessary to be a candidate. Krasno said many women did not seek the office because they could not win the support of their countries’ governments -- in some cases, because they did not belong to the ruling political party. A secretive U.N. process, she said, made it difficult to know when the 15 members of the Security Council were considering the new secretary general. “We were hoping for a more open process,” she said. Krasno teaches political science and international relations at Yale University, Columbia University and the City University of New York.